Sumeet Daga, Sulaiman Al Mezal, Ahmed Suleiman and Rohan Steven at the signing ceremony. Amna Insulations, a leading provider of energy-saving solutions for the construction sector, has signed up as the Green Technology Sector sponsor for the upcoming Gulf Construction Expo in Bahrain. The Gulf Construction Expo is the northern Gulf’s showcase for the building material and construction sector, being organised by Hilal Conferences and Exhibitions (HCE). The expo will take place from April 24 to 26 April at the Bahrain International Exhibition and Convention Centre under the patronage of Bahrain’s Prime Minister HRH Prince Khalifa bin Salman Al Khalifa. A division of Al Mezal Group of Companies, Amna Insulations will take the lead as it showcases its smart, energy-saving, environment-friendly products and solutions for the construction sector. Amna Insulations’ executive director Sulaiman Al Mezal says: " Our support for Gulf Construction Expo is based not just on the business value that it provides our company and products. As the Green Technology Sector sponsor we will be leading on an issue that is growing in importance for the GCC’s construction sector, which concerns the impact of materials used in the construction sector on the environment. “This impact is not on what is installed today but the long-term degradation of building materials and their effect on our environment. We are delighted that Gulf Construction Expo has the vision to promote these issues because they impact on future generations living in the GCC," he said. At Gulf Construction Expo, Amna Insulations will be offering green technology solutions such as the LGS Construction System (which is newly developed with its own in-house modifications), Marmox Multiboard, (the world’s lightest construction and insulation board), Marmox External Thermal Insulation System, Politerm Light Concrete (the lightest thermal insulating concrete in the world) and Pleko Systems (an external insulation and finishing system). These products collectively by being energy efficient have a major impact on the environment, he said. Jubran Abdulrahman, managing director of HCE, says: "Smart construction and environment-friendly products are a growing movement for building and construction sector. We applaud the Al Mezal Group of Companies and Amna Insulations for championing green technology in the construction sector." 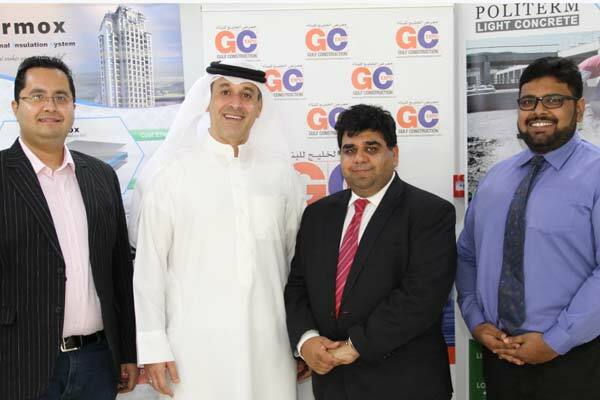 The signing ceremony was attended by Sulaiman Al Mezal; Sumeet Daga, head of business development, Amna Insulations; Ahmed Suleiman, exhibitions director, HCE; and Rohan Steven, project manager, HCE. Gulf Construction Expo 2018 carries the strategic sponsorship of Haji Hassan Group of Companies and Kavalani and Sons and Al Nisr Aluminum as the door and shutter sponsors.